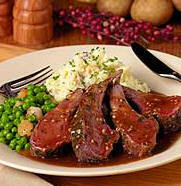 Gourmet low carb dinners, low carb food gourmet prepared dinners and meals are hard to find. Try our delicious gourmet high protein, low carb dinners and prepared meals. Our Low carb dinners are perfect for your next meal or for your health conscious guests. Online home delivery service. Roasted Rack of Lamb with Garlic Sauce, Grilled Filet Mignon, Roasted Crab Cakes with Lobster Sauce, Filet Mignon with Béarnaise Sauce, Beef Stir Fry, Blackened Chicken Breast, side dishes, meat and seafood samplers. Home Bistro - chef prepared low carb food meals / dinners... We create great recipes - everything from soups and appetizers to complete meals and desserts. We mix, blend, and sauté. We grill the steaks, roast the lamb, poach the salmon. 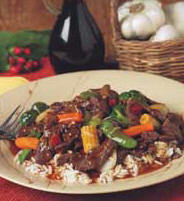 Try some of our best seller gourmet low carb food online meals & dinners like our Beef Pot Roast, Blackened Chicken Breast Dinners in Champagne Sauce, Gourmet Chef Prepared Roasted Crab Cakes in Lobster Sauce, Veal Saltimbocca Prepared Dinners, Gourmet Prepared Maine Lobster in Lobster Sauce, Gourmet Beef Burgundy Prepared Dinners or our Gourmet Chicken Marsala. All you need to do is follow the simple instructions to heat and serve our meals in about 10 minutes. It's that easy..
Low carb food with tender strips of seasoned beef with colorful and crispy stir fry vegetables and fluffy white rice in an authentic stir fry sauce made with brown sugar, garlic, and ginger. 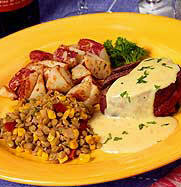 Grilled beef tenderloin in a satiny Béarnaise sauce made with shallots, tarragon, onion, and garlic served with herbed new potatoes and a lentil-corn medley. Looking for the perfect entrée' to serve special company? This elegant roast-size Filet Mignon is not only beautiful to serve, it's absolutely delicious and tender beyond belief! That's why they call this "The Roast of Romance!"